All transactions are safe and secure with a reliable history in online purchasing behind each of our associates. 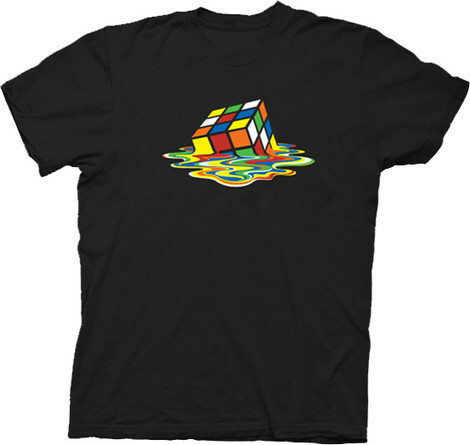 Buy the Sheldon Melting Rubik's Cube t-shirt to own Big Bang Theory clothing and merchandise. Get the melting Rubik's Cube t-shirt that Sheldon wears in the season five episode titled "The Speckerman Recurrence." Wear it as you watch your favorite BBT episodes or play with your own Rubik's Cube. We recommend you don't try to melt it in an effort to make life imitate art. Repeat your favorite Sheldon quotes in it, including, "There is a fine line between wrong and visionary. Unfortunately, you have to be a visionary to see it." This quote can be heard in The Big Bang Theory episode "The Pirate Solution." During the episode Sheldon hires Raj to work for him (not with him) on a problem involving dark matter. The Sheldon Cooper t-shirt above is identical to the one worn by Jim Parsons' character. If you see yourself as a visionary, then pick up this Big Bang Theory tee. You can't go wrong. In addition to the Sheldon Melting Rubik's Cube tee above, browse the Big Bang Theory Clothing Gallery for more apparel like men's and women's clothes, kids shirts or hoodies.